Our Congregation is blessed with a beautiful campus on nine acres of land. It is our spiritual home and the home to two weekday schools. On Sundays we have between 150 and 300 people coming together to grow in spirit and Monday through Fridays we have between 50 to 70 children, teachers, and parents coming together to grow in knowledge and play. Maintaining the buildings and the grounds requires help from everyone. When it comes to caring for this home, we are a big family working together to ensure that our home is welcoming and safe for everyone. repairs and preventative maintenance. My full-time position as Congregational Administrator makes some of this responsibility easier for me to handle but like with most staff positions in the congregation, it is also my responsibility to seek those in our community who can share the ministry with me. Report maintenance issues to me in the office. You can do this by writing down the maintenance issue on the Maintenance Repair List on one of the clipboards located in Office 2 or the Kitchen, or calling me in the office at 602-840-8400 or emailing me. Whichever communication method is easiest for you to get the repair issue reported to me is fine. Every Monday a volunteer will review maintenance issues reported, investigate the issue, and help me prioritize issues within the scope of the annual budget for building and ground maintenance. 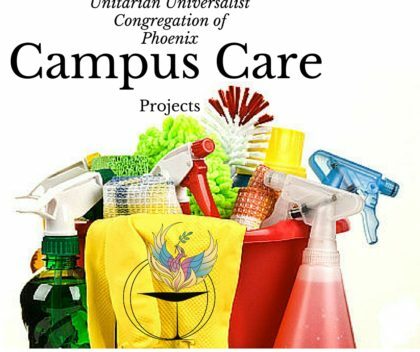 Pick a Campus Care Project to complete. See list and details below. Here are some projects that anyone can do to help care for our campus! Contact Lora if you are willing to take on any of these jobs and indicate a day/time you’d like to work on the task. Certificate are available for those who need community service hours. Wipe down all interior doors and doorknobs. Wipe down all restroom stall doors and walls. Clean tables in Johnson Room. Touch up paint throughout campus. The table in Office 2 needs some TLC. The legs are loose and wobbly and the table needs to be sanded down and a fresh coat of stain applied. This is a solid wood conference table and is worth the love and care. Clean the little windows in the main building. Clean out the Memorial Garden pool of debris and remaining rain water. Dust wooden name tag racks in Sanctuary.